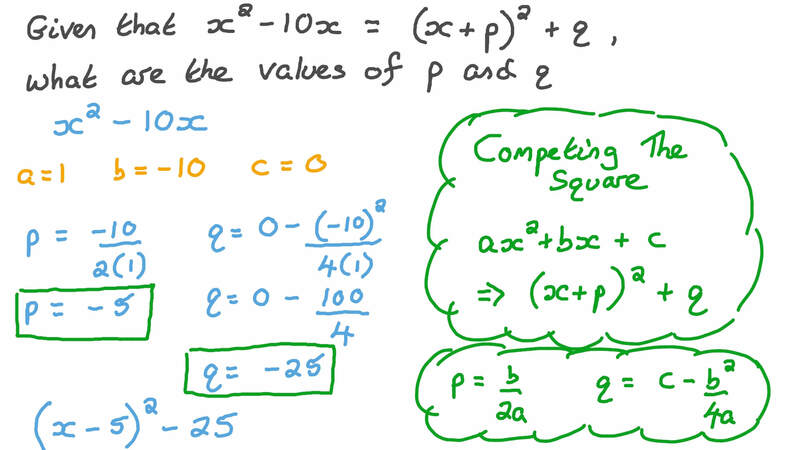 In this lesson, we will learn how to complete the square for expressions where the coefficient of the leading term is one or otherwise. Given that 𝑥 − 1 0 𝑥 = ( 𝑥 + 𝑝 ) + 𝑞 2 2 , what are the values of 𝑝 and 𝑞 ? Given that 𝑥 + 2 𝑥 + 5 = ( 𝑥 + 𝑝 ) + 𝑞 2 2 , what are the values of 𝑝 and 𝑞 ? Given that 3 𝑥 + 3 𝑥 + 5 = 𝑎 ( 𝑥 + 𝑝 ) + 𝑞 2 2 , what are the values of 𝑎 , 𝑝 , and 𝑞 ? 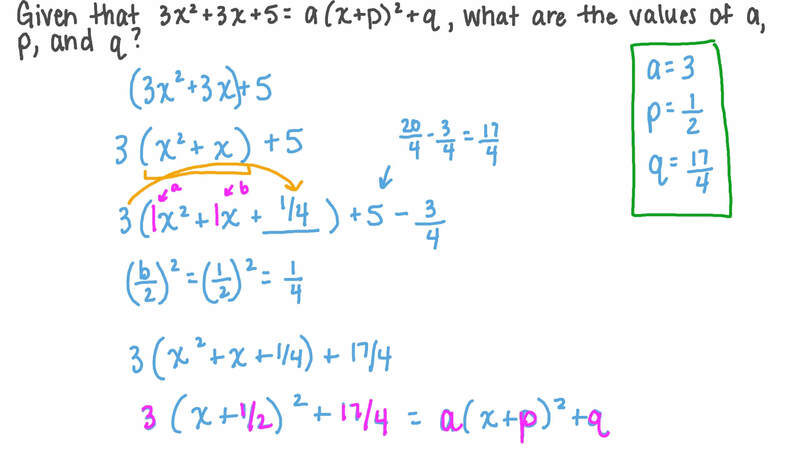 What is the vertex form of the function 𝑓 ( 𝑥 ) = − 𝑥 + 6 𝑥 + 5 2 ? 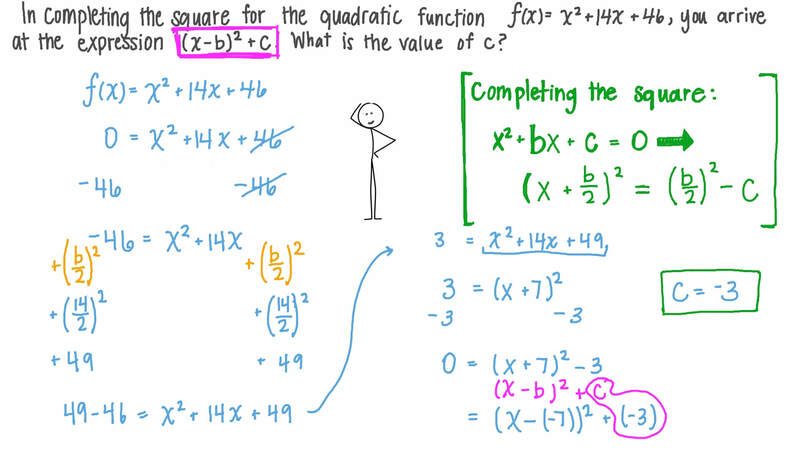 In completing the square for quadratic function 𝑓 ( 𝑥 ) = 𝑥 + 1 4 𝑥 + 4 6 2 , you arrive at the expression ( 𝑥 − 𝑏 ) + 𝑐 2 . What is the value of 𝑐 ? Given that − 𝑥 + 3 𝑥 + 4 = 𝑎 ( 𝑥 + 𝑝 ) + 𝑞 2 2 , what are the values of 𝑎 , 𝑝 , and 𝑞 ? What is the vertex form of the function 𝑓 ( 𝑥 ) = 5 𝑥 − 𝑥 + 1 2 ? Write the equation 𝑥 = 3 0 − 1 3 𝑥 2 in the form ( 𝑥 − 𝑝 ) = 𝑞 2 . Write the equation 3 𝑥 + 𝑏 𝑥 + 𝑐 = 0  in the form ( 𝑥 − 𝑝 ) = 𝑞  . Write the equation 𝑥 + 6 𝑥 − 3 = 0 2 in completed square form. Write the equation 1 + 𝑥 = 𝑥 2 in the form ( 𝑥 − 𝑝 ) = 𝑞 2 . Write the equation 𝑥 + 𝑥 + 1 = 0 2 in the form ( 𝑥 − 𝑝 ) = 𝑞 2 . Write the equation 3 𝑥 − 1 = 0 2 in the form ( 𝑥 − 𝑝 ) = 𝑞 2 . Write the equation 𝑥 − 𝑥 = 3 4 2 in the form ( 𝑥 − 𝑝 ) = 𝑞 2 . Write the equation 𝑥 − 2 √ 3 𝑥 + 1 = 0 2 in the form ( 𝑥 − 𝑝 ) = 𝑞 2 . Write the equation 3 𝑥 + 𝑏 𝑥 − 1 = 0 2 in the form ( 𝑥 − 𝑝 ) = 𝑞 2 . Write the equation 𝑥 + 𝑏 𝑥 + 𝑐 = 0 2 in the form ( 𝑥 − 𝑝 ) = 𝑞 2 . Write the equation 𝑎 𝑥 + 𝑏 𝑥 + 𝑐 = 0  , where 𝑎 ≠ 0 , in the form ( 𝑥 − 𝑝 ) = 𝑞  . Which of the following equations can be transformed into the equation 2 𝑥 + 2 8 𝑥 + 6 = 0 2 by expanding, rearranging, and multiplying by a scalar? Given that 𝑥 − 𝑥 − 𝑐 = 0 2 can be written in the form ( 𝑥 − 𝑝 ) = 3 2 , find the value of 𝑐 . Find the values of 𝑎 for which the equation 𝑥 + 2 𝑎 𝑥 + 𝑎 + 𝑎 = 𝑎    is satisfied by only one value of 𝑥 . Given that ( 3 𝑥 − 2 𝑦 ) = 6 2 and 9 𝑥 + 4 𝑦 = 6 2 2 , find the value of 𝑥 𝑦 . Which of the following equations can be expanded and rearranged to 𝑥 + 1 = 8 𝑥 2 ? By writing 𝑥 + 2 𝑎 𝑥 + 𝑎 = 0 2 in the form ( 𝑥 − 𝑝 ) = 𝑞 2 , determine when the equation has no real roots. Factorise fully 2 4 𝑥 𝑦 + 3 𝑥 + 4 8 𝑦 2 4 2 .